Alongside the New Balance RunIQ, Casio’s WSD-F20 was the other big piece of Android Wear-related news at this year’s CES. The iconic Japanese watchmaker has been quick to give us a successor to the WSD-F10, which launched last year. Casio says it has listened to the feedback and given the people what they want. What hasn’t changed though is that rugged outdoor look. It’s still a big ol’ smartwatch, even when you compare it to outdoor watches like the Fenix 5, so it’s not going to be one for slender wrists. 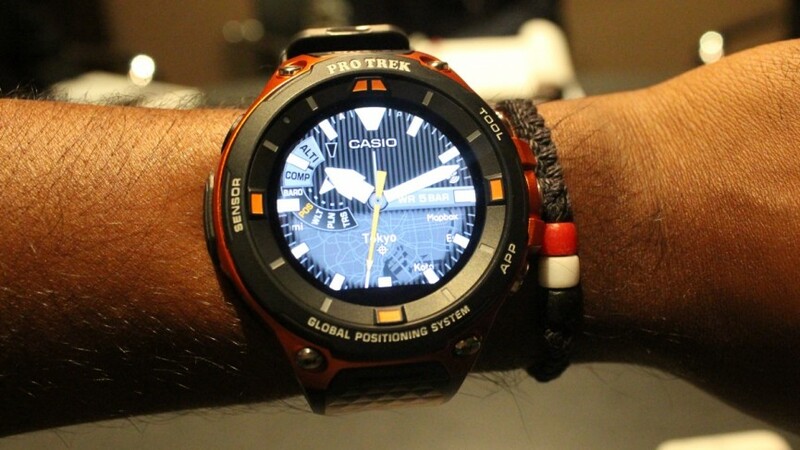 Casio has managed to make the casing a little slimmer but even still, it’s undeniably a beast of a smartwatch. Design-wise it doesn’t shy too far away from the original. It’s still available in black or orange and the latter definitely looks a lot nicer. You’ll spot the screws at the top and bottom of the display, the three physical buttons and the charging terminal above the host of sensors included. It’s still built to military standards and now the bezel has been beefed up to offer even more protection for the touchscreen display. Nothing has changed on the screen front. It’s the same sized LCD display so you should expect similar levels of visibility in the bright outdoors. The colour screen is being put to more use now thanks to the introduction of satellite view-style colour maps you can view from the watch offline. That’s definitely a welcome addition in our book. So let’s talk about GPS. When Casio and Nixon delivered their rugged Android Wear smartwatches last year, we were pretty surprised that Casio didn’t follow suit and include built-in GPS. Casio told us the reason it wasn’t included in the first watch is because it was concerned about power consumption. 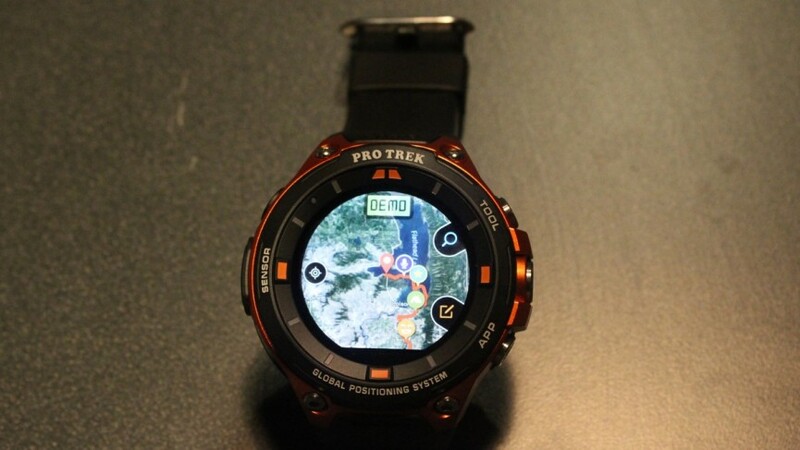 Now it’s managed to include a low-power GPS chip (with Glonass and Michibiki support in the works) to help make this truly a watch built for adventurers. Having the GPS on board has opened the door for Casio to offer more features other than tracking routes. It’s going to improve activity tracking and tap into the new Location Memory feature, letting you lay markers along your route. That ability to tap into the hardware to make it more useful is also mirrored in the way Casio’s has tried to customise the Android Wear experience. Google’s operating system is still at the heart and is set to be upgraded to Wear 2.0 when it launches. Its presence, however, doesn’t feel as great as it does other Wear smartwatches. That’s because clearly a lot of work has been done to make it feel more unique. From the detailing in the watch faces to the native and third-party apps, Casio has looked at every opportunity to make this truly feel like an outdoor watch. So has Casio improved on its predecessor? Yes, in a lot of ways. 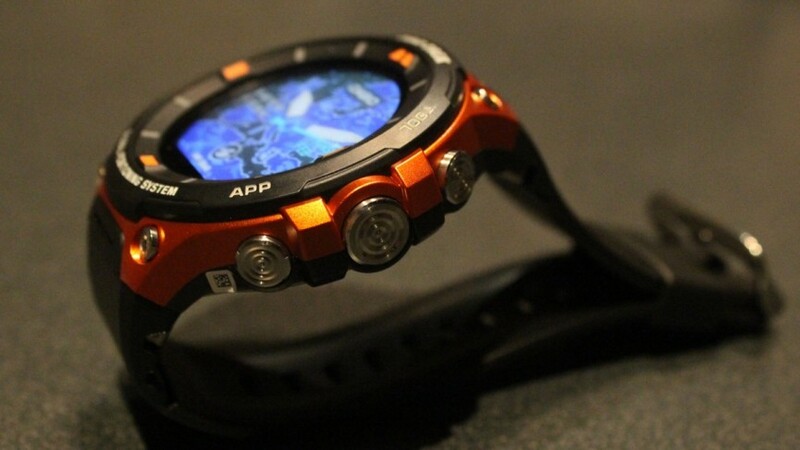 GPS is finally here, and while it’s still unashamedly big, it’s a decent-looking smartwatch. The little touches made to make Android Wear feel more unique work well. $500 will get you one, which means you’re going to have to pay the same premium as a high-end Garmin, Suunto or Polar outdoor watch. The one major thing it lacks in comparison to those established names is battery life. You’re still getting around a day with the Casio, and for someone that’s hoping to trek for days and doesn’t want to carry around a charger, that’s going to be an issue. If you can live with that, then the WSD-F20 might still have appeal.